(Newsstand Date: July 1, 2008) Its blue skies and rolling hillsides have inspired such great artists as Cezanne, Van Gogh and Chagall. Now let the legendary land in the south of France inspire you as we take a journey to Provence.Whether you have been a visitor to this famous landscape or you just dream of going, we invite you to share your vision of Provence in your mixed-media art submissions to be considered for the July/August 2008 issue. Consider the cobbled streets of a tiny village, fishing boats in the harbor at Marseilles, or the rush of the Mistral through ancient vineyards — what is it about Provence that sings to you? We must receive your artwork by February 15, 2008. 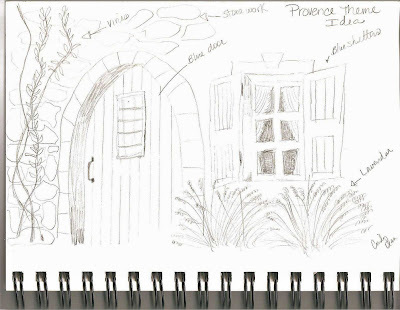 So, tonight I can up with my basic idea of what I think of when I think of Provence. I think of stone houses with blue shutters and vines running up them and lavender plants. Here is my rough sketch of my plan. I can't tell you how it will come together, you will just have to stay tuned to see the progress unfold. I think I will have some unusual ways of piecing this together. I hope my ideas work the way I want them too!!! Maybe it's just my computer, but I am having a very difficult time reading the text on your blog with the current background. The outside is snowflake, but the inside (where the text is) is very dark brown, with black text on top. Just wanted to let you know in case I'm not alone in this! Yay, now I could read your post. This idea sounds beautiful. Can't want to see it -- but just let the ideas flow -- if it goes somewhere you didn't intend, let it. Forcing ideas never works with art!!!! But the sketch is great!!! !